Back row, left to right: Sue Williams, Diane Kounis, and Paula Duggan. Front row, left to right: Trish Jackson, Carolyn Italiano, Chrisine Williams, and Alana Williams with Kyzer the dog. Photo: Matthew Lau. The Work Readiness Toolkit for students is the first in a suite of resources to support the Transition to Adult Life (TAL) project. 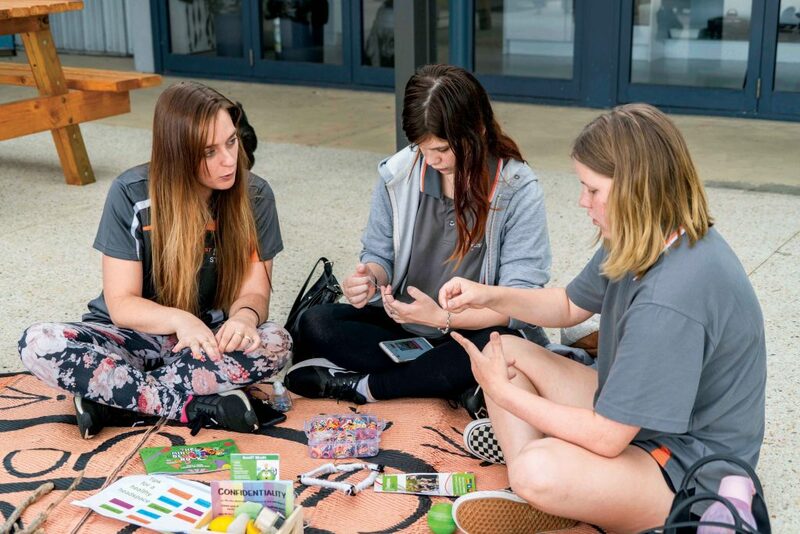 Christine Williams, a consultant with CEWA’s Students with Disability Team, said CEWA was committed to providing appropriate support for students who have additional needs, which at present is 2467 students across its 162 schools. Support includes individualised learning plans; access to specialised programs, resources and equipment; small group or individual instruction and teacher assistant support. 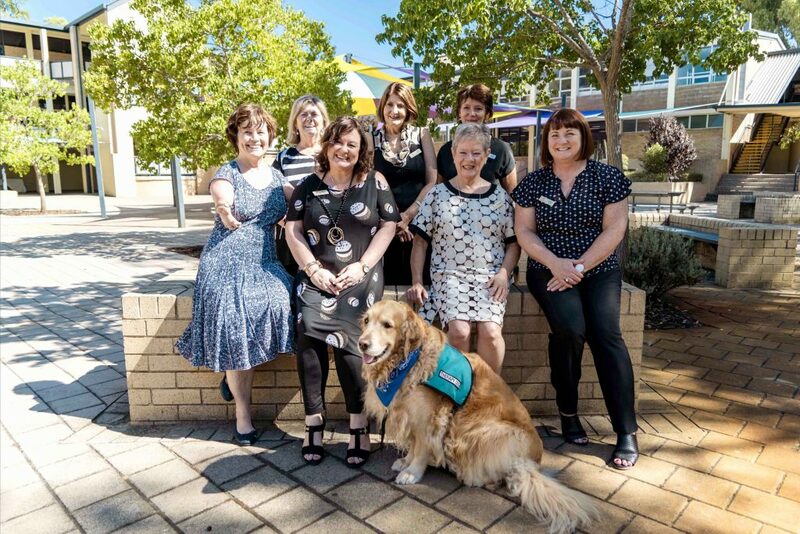 CEWA has also established 23 education support centres in designated primary and secondary Catholic schools for students with disability whose educational needs require the additional support and resources. Key principles of the syllabus, Ms Williams said, were to ensure transitional support to adult life which is centred on Catholic ethos and identity, to provide person-centred planning and to provide accredited programs. Most importantly however, the TAL project is about partnerships with all stakeholders. The resource, which has had input from Secondary Education Support Network at all stages of development, was launched at the Newman Siena Centre on 11 March. Youth Worker Courtney Gratteri with students of St Francis School, Maddington. Photo: Matthew Lau. St Francis School in Maddington is a shining example of what a Catholic, co-educational CARE school can achieve as one of the pilot schools for CEWA’s TAL program. Principal Ian Hagen said the program was initially trialled with Year 12 students in 2017 and 2018. Realising the benefits that it has, the school decided to begin the process for all students in Year 10, or when they enter St Francis. Established in 2015, St Francis School operates using a “reimbursement” model, in an attempt to provide its students with life experiences they may not have had as young children growing up. Mr Hagen is determined to have every one of his pupils leave St Francis as functioning members of society. “For some of our students, they’ve had such negative experiences throughout their lives,” he added. As an example, one of St Francis’ 17-year-old students has been in more than 20 different placements, including residential and foster care, since the age of three. “Providing those students with an environment that nurtures them and helps them to flourish is what we do,” Mr Hagen stated. Courtney Gratteri, Youth Worker at St Francis School, explained how part of the transitional process is to equip students with important life expertise, such as resume writing, cover letters, obtaining a tax file number, opening a bank account, or accessing Centrelink support. “In terms of transitioning out of school, we just start having conversations with students and actually talk them through that process and tell them that they’re not alone. “There’s a shared experience happening across the school with their peers, and how we can best set them up so they can continue on that strong path,” Mrs Gratteri said. “My purpose is to support young people in becoming the best versions of themselves. I love being a positive female role model, I love seeing strengths in young people that maybe have never been spoken about or identified, and just pointing them out. Establishing a safe and comfortable environment, she said, is vital to influence the success of TAL. “Knowing that I’m part of a bigger team, a bigger vision, a bigger purpose – God’s plan – is the best feeling in the whole world because I know I can do something in this world. “I really love serving people, I love just giving it my best and surrounding myself with people who believe and know that there’s just so much more to what we do every day,” Mrs Gratteri continued.